As you’re already aware, from 1st April 2018 landlords will have to ensure that their rental property has a minimum EPC rating of E. These new regulations apply to new lets and tenancy renewals. You could be fined thousands of pounds if you breach these regulations unless you are exempt. If your property has an EPC rating of F or G there are some actions that you can take to get your rating up to an E at the very minimum. 1. Put a jacket on your hot water tank to keep your hot water hot! A more efficient hot water and heating system with a well-insulated tank can save you/or your tenant up to £150 per year. 2. Use draft excluders wherever required. If you have a well insulated home but a gap where cold air passes under the front door then you may want to add a draft excluder. Most shops have an array of draft excluders from brush strips to use at the bottom of doors to draught proof strips that can be put around your loft hatch. 3. Change halogen light bulbs to LED. When you feel the heat coming off a halogen light bulb it’s obvious how much energy they use but don’t wait for them to blow before replacing them with an LED bulb. You or your tenant will save both energy and money. Look at energy rating labels when buying appliances and think of the size of the appliance – the bigger the appliance the more energy it will use. In the last decade, assessment methods have changed and your property may have a better EPC rating that you thought. Our EPC advisors can also give you first hand advice on how to improve your property’s energy efficiency and meet the minimum EPC rating. Don’t immediately think of double glazing, there are much more economic alternatives such as secondary glazing film (available in most DIY stores) or kits. Take a look at some YouTube videos for how easy it can be. Secondary glazing can be a simple and cost-effective way of saving energy and money by reducing heat loss and preventing draughts. Do your research into government grants that can help to pay for energy efficiency works. The easiest way to see which energy grants you and your tenants are eligible for is to use the HMRC Energy Grants Calculator. This calculator will tell you which grants are available based on the energy-saving improvements you’ve implemented in your property. 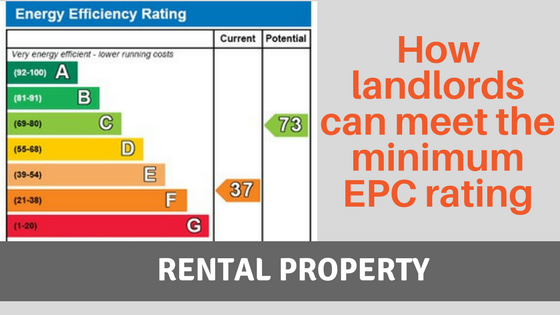 If you believe that your rental property rated F or G should be exempt from the minimum EPC rating then you must register your details. Examples of exemptions include you’ve been a landlord for less than 6 months or that the building is listed and certain works cannot be carried out.